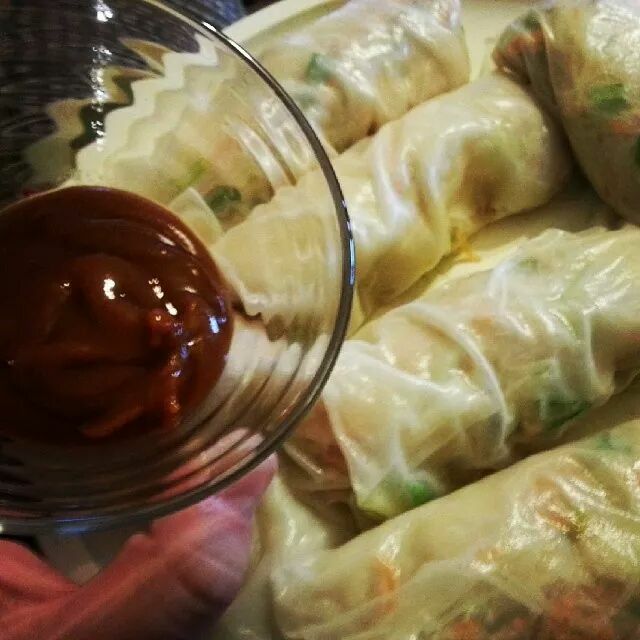 I’ve gotten a few requests for the recipe for those spring rolls we made a couple of days ago, and to be honest, I didn’t really use a proper recipe. I will, however, give you some basic guidelines…the rest is up to you. 1. In a large mixing bowl, thoroughly mix first five ingredients. Run a knife through the mixture a few times to break the noodles into small pieces. 2. Fill baking dish with 1-2 inches of warm water. You may want to go ahead and set up an assembly line this point. Start with the stack of rice papers and the pan of water. Have a clean work space next and the bowl of filling, followed by a plate covered with wet paper towels. 3. Take one rice paper and gently lay into the water, fully submerging for ten seconds. Carefully remove the paper and lay on a clean work surface. Place a heaping tablespoon of filling about one third of the way down the paper. Fold down the top, keeping the filling together. Fold in the sides and roll until filling is completely sealed. 4. Place on plate and cover with wet paper towel until ready to serve. This made twelve rolls. Keep in mind that these are served cold, so there’s no need to heat anything. Heat peanut butter in microwave. When easy to stir, add other ingredients and mix thoroughly. Let cool and serve alongside spring rolls. Most of these ingredients are pretty easy to find; I did have to go the local Asian market to procure the rice papers.